The Walkin' Wheels was first introduced in August 2008 and has changed the canine cart industry. It is different from all the pet wheels sold in the last 20 years because it is completely adjustable. 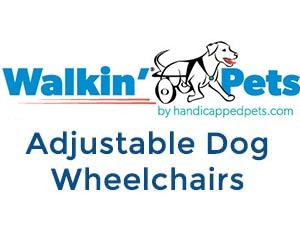 This means that the Walkin' Wheels can be purchased 'off the shelf', will be shipped immediately, fit your dog perfectly, and can be resold to any other dog when you no longer need it. In addition, the Walkin' Wheels is the first k9 cart that can be used, not only on dogs with permanent mobility problems, but also on dogs who need temporary help during recovery and rehabilitation. Adjust length, width, and height without tools. Benefits of the Walkin Wheels Dog Wheelchair. Adjustable: One size fits all dogs from 20 to 200 pounds. Easy to Order: Requires only one approximate measurement to help determine the right size wheels. Off-The-Shelf: Available for overnight delivery. Easy to use: Dog can be put in, and taken out of the wheelchair without lifting. High Grade, extruded aluminum frame is virtually indestructable. No tools needed for adjustment. Serviceable: All parts and components can be easily replaced. Veterinarian Approved: Dozens of veterinarians use and write about the Walkin' Wheels. Award Winning: Walkin Wheel's won Best Innovation Award for Walkin' Wheels Dog Wheelchair at Mascota International Pet Show. Looks Great: A Slick design is nothing to be ashamed of. Return Policy: If the cart is returned in 'like new' condition, our return policy is easy. Backed by the largest, most reputable handicapped pet website (you know the one! ).